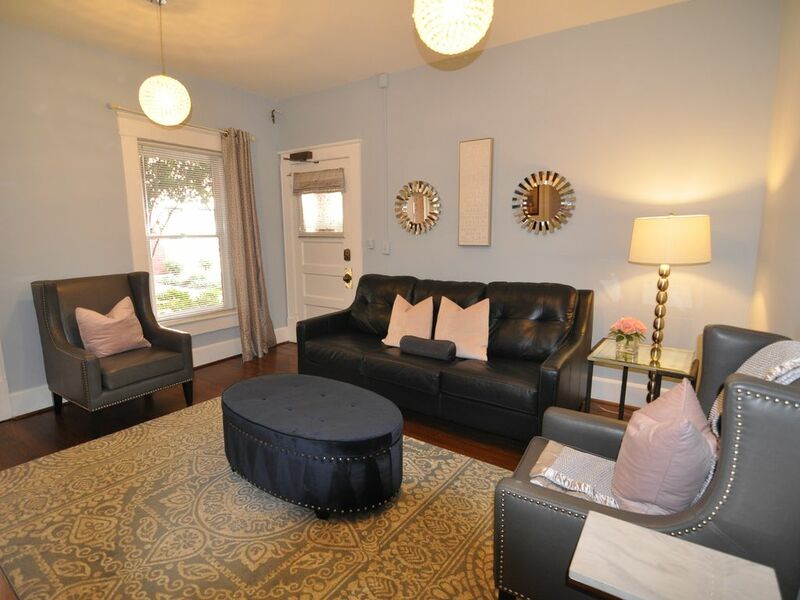 Enjoy an easy 3 block walk to Main St while staying in this trendy 1 bedroom apartment in a historic downtown apartment building, The Davenport. Its lovely courtyard offers a respite from the busy streets of downtown nearby, and this main floor apartment has been restored to maintain the charm of the 1920's and the edgy style of today. Just 3 blocks to main street or the BiLo center, with Publix grocery store, restaurants, spas, shopping and multiple gyms within 1 block. The 385 is more easily accessed here than from Main St, making this a perfect location for the commuter who wants to live in Greenville's enchanting downtown. This property is an excellent option for guests planning to stay for longer periods. Please call me to discuss rates if you are considering a longer term stay. Your host, Tricia also owns listing # 773200. Please see the 5 star reviews on that listing and feel confident that you'll be treated with warm hospitality & that these accommodations meet an equally high standard of comfort. A comfy queen size bed and worktable near a large window with natural light furnish the bedroom. The living room offers a leather chairs and queen size sleeper sofa, TV and free WiFi. The dining room offers a table for 6 and a reading area near the window. The bathroom has been completely renovated with period appropriate marble & subway tile, and though its tiny, offers plenty of storage. The kitchen has been reworked with an exposed brick wall, all new appliances, fresh bamboo flooring, a coffee bar and all the amenities you'll need to make a delicious homemade dinner. Parking is free on a surface level lot 1 block away. The apartment can be accessed from the back or front of the building. A common (coin) laundry is down 1 flight of stairs. No Pets or Smoking are allowed in the apartment or in the Courtyard as it is disruptive to the neighbors. Tours can be arranged with the owner for longer stays. Please call Tricia with any questions. I'm always happy to speak with you! I'm a Mom of 2 and former Realtor who has a passion for real estate, design and Greenville! Being a host with VRBO (check out my first property at listing #773200) allows me to be available to my family while still working and fulfilling my passion to create beautiful spaces for wonderful people! I truly hope you'll enjoy the space I've happily planned with you in mind, and that you'll feel free to call me and chat about whatever questions you may have about the area. I love my guests and am here for you 24/7! I have had my eye on this gorgeous building ever since I first saw it in 2013. It exudes charm and historic elegance and allows residents to be "in the action" but still escape from it and feel like they are in a residential community. When we bought this condo, it had potential, but as it had been an office and a residential rental for almost 100 years, it was in need of TLC. Some things couldn't be fixed, others were left in their aged state to allow history to live on, and others were re-imagined. One day the 100 year old trim will be refinished, as will the floors, but for today, they tell the story of their many years of keeping Greenville-ians safe and comfortable. 1 block to Public, Staples, hairdressers, restaurants, the gym, a cycle bar (for working out), and 5 blocks to the BiLo Center. Directly across the street from Christ Church Episcopal for Church events. Quick access to 385 and Church Street for avoiding downtown congestion and getting places quickly. Bright and freshly remodeled with marble floors and inlaid marble shower, all new tub, toilet, vanity, mirror, lights and even fancy decorative ceiling tiles. Renovated with Quartz countertops and all new appliances. Exposed brick walls, a giant window with a sunny little seating area for a cup of coffee. Plenty of storage for your things on open cabinets. There are 2 steps up into the courtyard, otherwise all accesses flat. However, parking is one block away. Cute space in a great location! Perfect space for our small family to spend the weekend and see the sites of Greenville. The owner was very accommodating. Overall impression was very positive - loved the property and proximity to downtown! The property was fantastic, very charming historic building, restored nicely. Downtown Greenville is a quick walk away and equally charming. Owner was very prompt to return our call and answer questions. Great job! Beautiful condo steps from restaurants and shops. This historic condo is beautifully renovated and perfectly clean. We had a wonderful visit and enjoyed the Fall for Greenville festival, which we walked to, and the zoo, a short drive away after check out. The owner is very responsive as well. Fantastic location and lovely condo. Beautiful home in a historic building within walking distance of downtown and the arena! Quaint, Cozy, Sophisticated! Excellent stay and close to everything downtown. Guests must be over the age of 25 to book. No smoking and No parties. Regrettably, I can no longer accept pets.